City cars and superminis - part 1 | What Car? Audi is bang on the money with its posh new Mini rival. The three-door A1 has the image, the quality and the driving dynamics to really shake up the supermini class, and theres a lot more to come from the car. Unlike other so-called premium superminis such as the Alfa Mito, Citron DS3 and Mini the A1 will soon be available with five doors. Or as Audi likes to call it, a Sportback. That wont make the A1 any bigger in the back, but it will make getting into and out of it easier. Fitting a child seat in the rear will be a simpler task, too, boosting the Audis appeal with young mums. 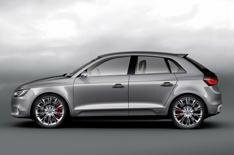 The Sportback will go on sale next autumn, carrying a 500 premium over equivalent three-door models. Engine options will remain the same, which means there will be two turbocharged petrols an 84bhp 1.2 and a 120bhp 1.4 and a 103bhp 1.6-litre diesel. Before the Sportback comes the hottest A1 yet. Powered by the 182bhp supercharged and turbocharged 1.4-litre petrol engine from the new VW Polo GTI, it will sprint to 62mph in just 6.9 seconds and top 140mph. Fuel economy wont be too shabby, either, at 47.9mpg. Itll go on sale in January with a price of around 20,000. Hardly a bargain, but that price will get you top-of-the-range S line trim and a seven-speed S tronic twin-clutch gearbox as standard. The cost of hybrid powertrains is falling, and Honda reckons it can slot one into a supermini and still make a profit. Its new Jazz Hybrid uses the same petrol-electric IMA system as the Insight: a 1.3-litre engine and a CVT gearbox, with an electric motor between the two. Like the Insight, the Jazz can run on electric power alone at low speeds over short distances. With CO2 emissions of 104g/km and average economy of 64.2mpg, the Hybrid will be the greenest model in the Jazz range. However, were surprised it doesnt creep under the magic 100g/km mark, given that the larger Insight puts out 101g/km. At 104g/km, annual VED is 20, although its not London Congestion Charge-exempt. The Jazz Hybrid has been given an Insight-esque chrome front grille and new headlights. Inside, theres a darker dashboard and blue lighting for the instruments. The 208 will buck the trend of modern cars by being smaller than the 207 it replaces. Despite this, itll have more interior space and a better-quality cabin. Peugeot is hoping the 208, shown here as a computer-generated image, will revive the companys reputation for building great-riding, great-handling cars. It will be lighter than the 207, which will certainly help, and Peugeot is even developing bespoke shock absorbers. Its still a couple of years away from production, but Peugeot has hinted that the SR1 and HR1 concept cars shown at the Paris motor show earlier this year will influence the 208s styling. A range of three-cylinder petrol engines will power it. Theres good news for hot hatch fans, too. Last year Peugeot said the GTI is dead as far as its concerned, but has had a change of heart. A 208 GTI will be built for the UK and German markets, and it is likely to use the 197bhp 1.6 THP engine from the RCZ coup. Chevrolet unveiled this showroom-ready Aveo at the Paris motor show earlier this year. Its longer and wider than the current model, and Chevy claims its boot is big for a supermini. All new Aveos will have five doors the handles for the rear two are hidden in the C-pillars. Other nifty design features include a motorbike-inspired instrument binnacle. Chevrolet has carried out testing on European roads. It promises lively handling, which bodes well for the hot RS version set to follow in 2012. Aston has confirmed that its Toyota iQ-based Cygnet will go into production next summer. The smallest-ever Aston is mechanically identical to the iQ, but gets only the more powerful 97bhp 1.3-litre Toyota engine, emitting just 113g/km of CO2. Cosmetic changes include new bumpers and lights, and a leather-lined interior. Aston Martin boss Ulrich Bez said, Our customers need a small car for urban and city use, and they want the right tools for the job. The Cygnet needs to satisfy the demands of emissions and space. An all-new Picanto will make its debut at the Geneva motor show in March. Itll be longer and wider than the current model, and is likely to borrow its design cues from the Venga MPV. Itll get an ultra-clean 1.0-litre engine, too. Prices should start at 7k.